This wasn’t even supposed to be a home improvement project. Just a fix-the-loose-screw project. A couple of weeks ago, we noticed that the toilet paper roll holder was loose on one side, and it seemed the screw was either stripped, or the hole it was screwed into was larger than it was supposed to be, causing the screw to be loose. And today I made a trip to Lowes to purchase a wall repair kit (complete with a mesh patch, the spackel and spackel knife) to hopefully repair what I did last night. I’ll have to wait for someone (mom? Kenny?) to paint it for me. And I had to spend roughly $20 on a new toilet paper holder. I should have just let the old one continue to dangle in the air. I did manage to get the hole patched. Now just waiting for it to dry, so I can sand it and possibly add more spackel. I don’t know if it’s going to be dry enough to paint before Kenny comes home. At least I’ve learned to hold off on even the small projects until he’s around. 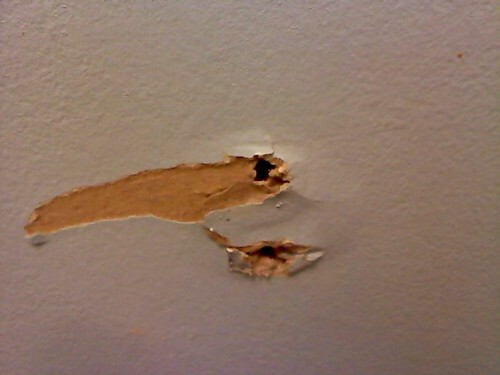 I don’t want to surprise him with holes in the wall again!